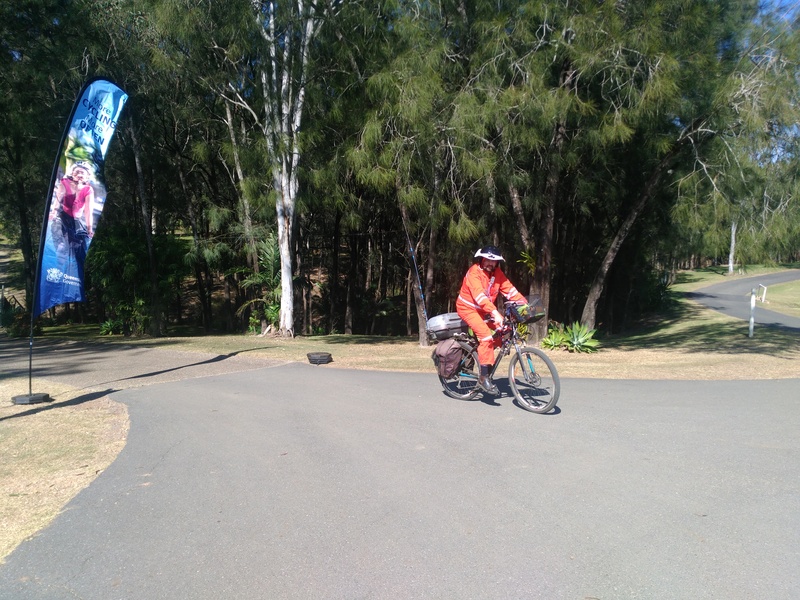 Last weekend, Bicycle Queensland held its second annual Yarraman to Wulkuraka Bike Ride. The event on the whole was a success, and we collectively have learned things along the way about areas in which we can improve. 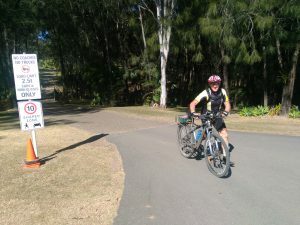 The event saw some 253 cyclists riding the route of the old Brisbane Valley Rail Trail through many of the historical townships in the area. While Brisbane Area WICEN group has had a long-standing relationship with Bicycle Queensland assisting with events such as the Brisbane to Gold Coast bike ride and the Cycle Queensland rides, this is the first time we’ve been involved in the Y2W event. 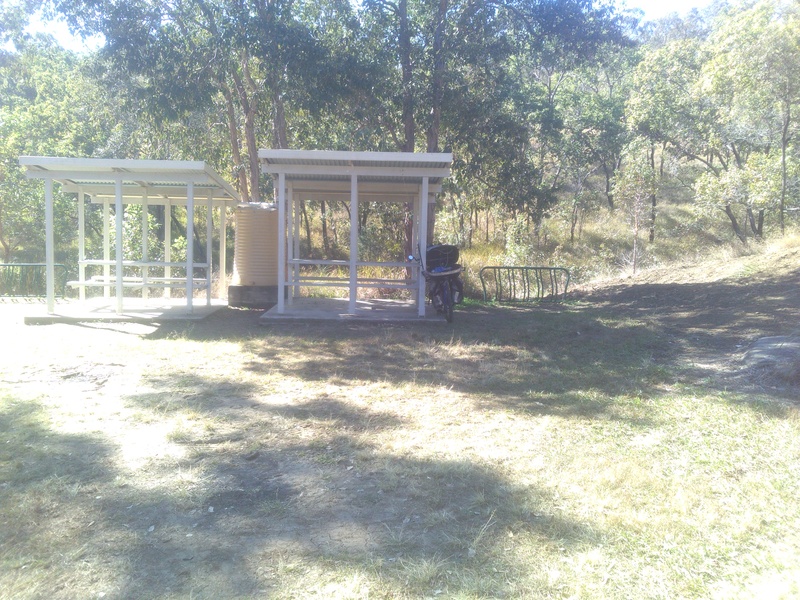 The Brisbane Valley Rail line was first completed back in 1913 and thus was built to the constraints of rail motors at the time. Crucially, this meant rather than taking the more direct route of the present-day Brisbane Valley Highway, the rail line took a more windy route in order to avoid hills. 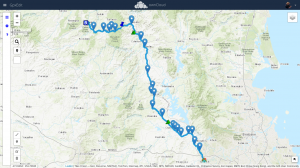 This means road-access to the track is nonexistent in a few places, and as it’s a rural area, the mobile network coverage varies from good to nonexistent. This proved to be a challenge running the first event in 2017: BQ couldn’t reliably cover the event using conventional communications technology. Even WICEN would have challenges: notably getting checkpoints into locations where motor vehicles are forbidden. For this, we’d need stations that were “bicycle mobile”. As it happens, yours truly has been doing this for many years. I’ve never done this off-road though, and while my mountain bike is designed for mountain-bike sports, it wasn’t designed to do this whilst having about 20kg of radio equipment on-board. This is the bicycle equivalent of Manfred’s pack! Many evenings were spent at Brisbane Hackerspace addressing points (1), (2) and (4). I ordered two new antennas (one HF, the other VHF/UHF), Simon looked into a new LiFePO₄ battery and work began in earnest. On the 10th June, Simon VK4TSC, Robert VK4HBW, a friend of Simon and Robert, and myself, did a ride from Benarkin through Linville to Moore. We operated mostly on 147.500MHz FM simplex, but between Linville and Moore, experimented with HF communications on 28.450MHz USB. For the run to Linville, David VK4MDL took up a position near a local 3G site (we think Optus) outside Benarkin whilst the rest of us rode to Linville. For much of the run, David used a hand-held radio, and maintained good communications. When things got patchy, he switched to using a mobile station, and communications remained clear. For my station, things mostly worked, until a fault developed in the control pad on the handlebars: the “down” button had gone short-circuit, confusing the FT-857D on my bike and preventing me from switching between 2m and 10m. The station did still let me transmit on 2m simplex though, so glass half full, I still had communications. At Linville, we identified the fault: and an errant wire got some side-cutter treatment. Rather than ride with us, Robert decided to jump in Simon’s ute and drive to Moore, where he operated a mobile station on the 2m simplex frequency. David remained at Linville, and operated on both 10m and 2m. As Robert needed the antenna, he used the antenna from Simon’s bicycle, so Simon borrowed my homebrew ¼λ 2m whip (made from a section of RG-213 coax and a PL-259 connector) at first. From there, it was plain sailing. I turned the power up on the 10m side to my full 100W and whilst at first, the audio was a bit choppy (we were likely de-sensing each-other), things got clearer as the distance increased. Part way into Linville, the antenna mount for my VHF antenna decided it had enough, and decided to let go of the angle bracket. We suspect the bracket in question (some scrap left around at HSBNE) was just a little too thick for the bracket. Simon and I decided at that point, it’d be easier if we swapped antennas, so he borrowed my Diamond NR-7900 and I used the homebrew antenna. The difference in his signal was dramatic, even compared to the antenna he was using en route to Linville. I could still get out reasonably well on 2m with my homebrew antenna as I had the advantage of brute force: a PA capable of 50W. We maintained good communications all the way into Moore. While there was a lot of down and up (the rail bridges over the creek crossings are long gone) which slowed my progress, there were no major issues from this point forward. We were confident we’d be able to cover the route effectively. These two remaining issues with my station were fixed over a few evenings at HSBNE. For Simon, there was a bit of refinement, but what he had would do the job just fine. Over the coming weeks, arrangements were made for where checkpoints would be stationed. Running of the event went well. We all organised ourselves to get to get there on the Thursday so we’d be there ready Friday morning. That afternoon, we were soon trying out our radio stations before mine got loaded back onto the car for transport to Benarkin. Friday morning was a late start by WICEN standards. Simon VK4TSC drove up to Yarraman to join the ride as tail end charlie, whilst I travelled with David VK4MDL to Benarkin. David was stationed at the gate at Benarkin, whilst I was the next checkpoint down at the site of McNamara’s Camp. We got to our respective locations with plenty of time. At first I got to mine, and reception of the repeater was at best, S2. My thoughts were “this seems dodgy” and I contemplated tuning up on 10m and switching there, but it seemed good enough to work with. Later I heard traffic on simplex at S9 and later tried with my handheld, and got through quite clearly. It was discovered there was an issue with the repeater itself. Al VK4AL soon was onto the case, and shortly after, the repeater was booming into McNamara’s camp at S9. Through my check-point, we had 250 cyclists and one motorcyclist (one of the local police officers on a trail bike) pass through. Soon as the tail turned up, I joined that and we rode on to Moore. The run in was largely uneventful with the exception of one of the hose clamps holding my front basket on rattling loose (a problem I’d been meaning to fix but didn’t). Thankfully, it was just a matter of getting the socket set out to undo that hose clamp, put it back in place and tighten it back up again, and we were on our way. 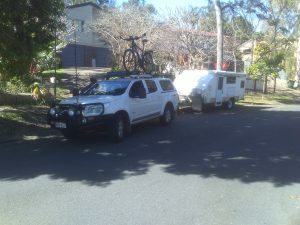 Day 2, I first helped David VK4MDL pack up the van so he could get to his checkpoint. The plan was that Simon VK4TSC was going to ride with the bicycle mechanic and I was going to be tail end charlie. 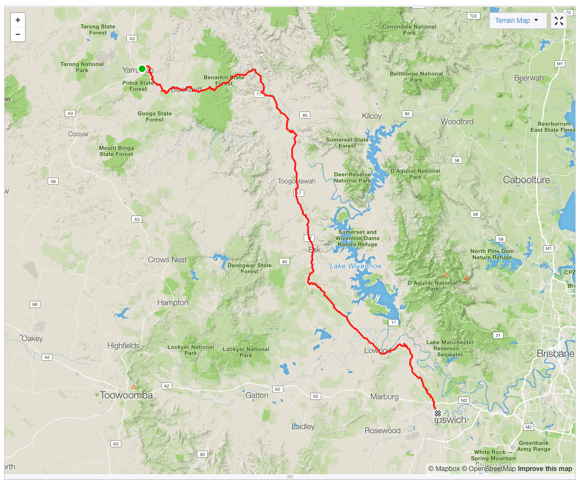 Toogoolawah-Esk on day 2 proved to be the biggest test of VK4MSL/BM, with the stretch made very rough due to ballast from the trail’s railway days. I think the basket fell off a good two or three times during that run. In Esk, we managed to fit an extra hose clamp on to hold the basket on which helped greatly. Outside Esk we had another hose clamp slip, so I fixed that up then rode the rest of the run into Coominyah with the socket wrench in the basket ready! The basket did not slip off again. Aside from Simon’s front tube deciding it had enough for one day (which we spent about 15 minutes patching), we made it safely into Coominyah. Day 3 was plain sailing. I decided to get going early so that I’d be somewhere in the middle of the pack. This time around I decided to leave the HF antenna behind and focus on VHF, since we were getting closer to the end point and so far VHF had performed fine. Simon VK4TSC once again was tail end charlie. The initial part of the run got a bit bumpy at first, and so I did what many cyclists did, switched to the bitumen road that ran parallel. There were a few other rough spots further along, as well as some gravel-filled culverts near Borallon that were a bit tricky to negotiate, but we got through those fine. Towards the end, one pannier bag on my bike decided it had had enough, and so I found myself re-distributing the load on my bike so I could empty the offending bag. The battery got moved into the top box. No big issue. I spent a few minutes at a few of the check-points talking to some of the operators there, so by the time I got to Pine Mountain, most of the group had passed me. I arrived at the finish about 1:30PM having left Coominyah at 7:25AM. Behind me were the last two riders for the event, the two sweep riders, then Simon VK4TSC who had yet another flat front tyre. I think the deployment was a success. As for the event in general, we had no major medical incidents: there were a couple of minor ones with a few scrapes (one requiring stitches at the start of one camp, that rider re-joined the group). It is hoped that BQ and Brisbane WICEN can work together on future Y2W events. 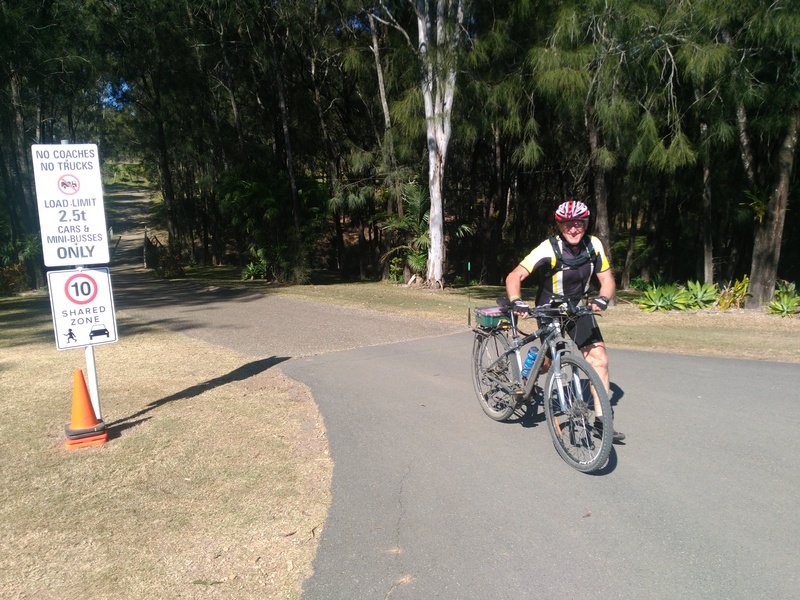 The next major BQ event is the Daintree to Cairns cycle tour which takes place in September, and oddly enough Brisbane Area WICEN will be assisting there too as well as with this year’s Brisbane to Gold Coast. Time will tell if either of those will involve bicycle mobile operation, but the precedent has been set. Update 2018-08-10: Bicycle Queensland have published some footage of the finish line on Facebook.